Sunrooms bring the year-round beauty of the outdoors into your home. 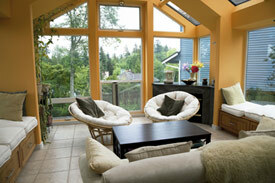 Bright and cheery, warm and cozy, sunrooms are the quintessential relaxation space. Perhaps it’s the nod to southern–style living that makes a sunroom somewhere to slow things down. Certainly, sunrooms bring the year-round beauty of the outdoors into your home. And loads of natural light will lift everyone’s mood. But there are design elements that can’t be overlooked when adding lots of windows. You’ll need a builder with a proven record of enduring construction. So when you’re ready to add a sunroom to your home, remember our many years of experience and long list of satisfied customers. Let our family help yours.